I have been catching up on my mail since returning from St. Helena and South Africa, and finally got around to opening the stuff that looks like junk mail. Of course, a lot of that stuff in there is actually important, and in the miles and points world, this is pretty explosive. It’s the first notice of an overt (rather than stealth) devaluation of a bank rewards program I have ever seen. HSBC points are devaluing. Is the money in your account next? Points in the HSBC Premier World MasterCard Rewards program spend like cash through a travel portal, similar to the US Bank or Bank of America rewards programs. Currently, for HSBC Premier members, the rate is 62 points per $1. However, as of April 2, 2018, the rate will increase to 80 points per $1. This is a significant devaluation, from about 1.6 cents per point in value down to 1.25 cents per point in value. I think this is most significant because it is the first major bank program devaluation. Banks have been fairly hesitant to devalue their award programs, and I think for good reason. You don’t want to associate a bank’s brand with the idea that your assets in that bank will lose value. In fact, American Express has responded to airline award program devaluations by offering periodic transfer bonuses into airline programs. This has helped to maintain the value of Membership Rewards points. However, HSBC crunched the numbers and must have decided that a money grab is worth the reputational risk. It’s an extremely aggressive move, because this impacts their Premier product–these accounts are for their highest value customers with over $100,000 on deposit. So, I think this is a shot over the bow. 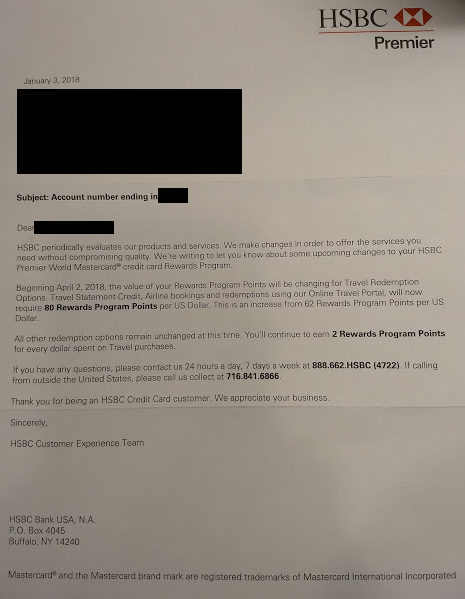 If HSBC is willing to devalue their points this much, and to do so for their highest value customers, I don’t think any bank award program is safe. For my part, I’ll be asking my HSBC banker whether they also plan to devalue the cash in my account. It’s amazing that this is the only place I’ve seen online where anyone is acknowledging this. When I walked into my local branch in Brooklyn a month ago, and started complaining, the Premier relationship manager didn’t even know what I was talking about. This is a horrible move by HSBC. I have 150,000 points I’ve been saving up for years, that will be devalued from $2,400 to $1,800 in a week. Once I made her aware of this thievery, the manager at the branch said “Why don’t you just book a trip?”, and literally belittled the fact that I’m making it a big deal. I’m very happy to say that this “trivial” move by them has started the wheels in motion for me to move ALL my business accounts, as well as personal to a new bank, as well as opening a Chase Sapphire Preferred Card to start accumulating points. With that many points, you might be better off moving them to either the Singapore or British Airways programs. You’d be able to redeem for a premium cabin business class ticket, which you’d be hard pressed to do even at the pre-devaluation price.